Order Your DIY eBike Guide Today! Electric bicycles have been quickly catching on in the United States as a convenient way to save gas and beat traffic, but their high prices have kept them out of the reach of most consumers. Now Micah Toll, a mechanical engineer and eBike expert is showing how these energy-saving vehicles can be built affordably by almost anyone through his new book, The Ultimate Do-It-Yourself eBike Guide and accompanying video courses. “I wanted to make this book and video course essentially the bible of do-it-yourself electric bicycles in the hopes of making ebikes affordable for everyone” says Toll. Toll has built hundreds of electric bicycles in the last few years, and has started teaching others to build their own eBikes as well. “It’s through that experience of helping beginners learn the basics of ebike conversions that I myself learned where most people have problems” says Toll. So his solution: write a book putting all his experience into words that anyone can understand and use. “I haven’t owned a car in four years,” he says. “I’ve gotten everywhere I need to go with electric bikes I’ve built and now I’m trying to help as many people as I can do the same.” And now that his book was successfully funded a few months ago on his first Kickstarter campaign, Micah is back funding his new video series to “go beyond the pages of a book and actually show people how to build an ebike by themselves”. Electric bicycles have been steadily growing in popularity in the United States, with over 200,000 ebikes expected to be sold in the US in 2013 alone. Many people have been ditching their car in favor of a smaller and more convenient option for urban transportation. While ebikes can save hundreds of dollars in gas each month, their initial purchase price isn’t cheap. Most of these decently powered commuting ebikes cost between $2,500-$4,000 with more premium models catching even higher prices. 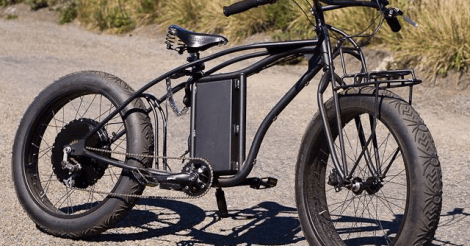 Micah’s book and video course shows that for less than the cost of commercial ebikes, sometimes for just a few hundred dollars, anyone can build a faster ebike with even more range. I actually picked up a copy of the Ebook a few months ago and I think it was worth every penny. Very informative. Good luck Micah!